"My grandfather Tom Knight was a trader at Brentford in the 1920s and 30s, he actually died on Christmas Eve 1933 from pneumonia, as a result of the freezing cold working at the market in the early mornings. He's buried in Heston Cemetery (St Leonards) with my grandmother who died in 1967." "His father Thomas Knight came from a family of farm labourers in Nottinghamshire, he moved to London in the late 1800s and he had his own business selling potatoes, he seems to have started trading at Brentford in the early 1900s and moved to Kew Green in 1911-12, obviously to be closer to his work." In the studio photo (thought to be from about 1917 when he enlisted) Tom is dressed in his Royal Marines uniform, I think he must have been around 17. 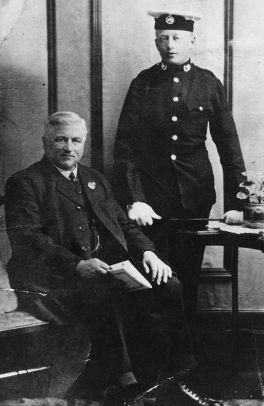 Thomas would be about 51 and was living in Kew and working at the market by this time, and I think Tom worked for him before enlistment." 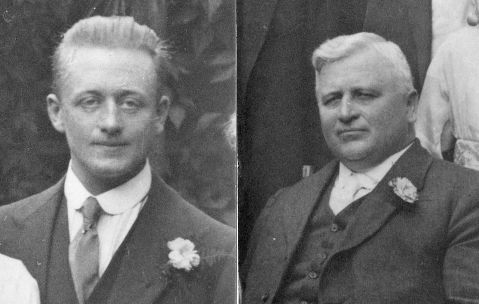 "These later photos are cropped from a group photo taken at Tom's elder sister Mabel's wedding in 1921, he would have been 22 and his father 56." Some day I would love to find a photo of his stall there, my father's cousin remembers visiting my grandfather at the market when he was a small boy, and he can still remember the stacks of potatoes in sacks with Thomas Knight & Son stamped on them." If you have a photo of the market in the 1900 - 1930 period please email. If your ancestor worked in the market, Janet McNamara's research into the history of Brentford Market from its origins to the current day will be of interest. If your ancestors worked there around WW1 take a look at the first and second pages from Kelly's 1914 trade directory showing names of the men who ran stalls in Brentford Market. These images ** are from the Historical Directories web site, which includes searchable trade directories. See Links page for access to this web site. ** NB to view the two pages above you will need Adobe Reader, which can be downloaded free of charge from the Adobe web site at http://get.adobe.com/uk/reader/ (the download requires over 40MB space on your PC). The first page includes Thomas Knight, potato salesman, selling from wagon stands 3 & 4.